The following facts about me are important pre-requisite knowledge for reading this particular blog. Most of you will know at least two out of three, so don’t get excited. I was a vegetarian from birth until I was 18 years old. I have always been strictly Kosher. I am an infuriatingly and nonsensically bad eater. Generally, my tastes haven’t changed since I was a kid, with a few notable exceptions. I now force myself to try new things once in a while, I now eat salad as long as it hasn’t seen a cut up tomato, (how hard is it to leave the cherry tomatoes whole?!) and I’m an unashamed carnivore, much to my mothers dismay. But (and here comes my point) in absolutely no world, no matter how adventurous an eater I was, or however irreligious I became, or however little I thought of the animal kingdom, could I ever fathom people who trek to a specialist candy store to purchase the below. 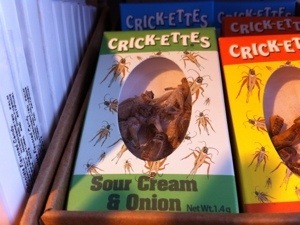 Sour cream and onion Crickets. For those intrigued rather than repulsed, they also offer Chilli, and Sea Salt flavours. These are basically the dare-devils answer to a bag of Revels. My advice is the same for both. I would recommend not munching through a box at the cinema. Nothing worse than chomping down on an orange treat and discovering its a sneaky coffee flavoured horror. I would imagine its similar when you think you’re getting a delicious beetle and accidentally begin chewing a centipede. Imagine how terrible that would be. But this isn’t even really eating an insect! 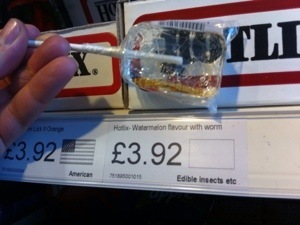 It’s just a worm, inside an ordinary lollipop. So you basically are eating an extortionately expensive chupa chup, with a bug in the middle. Do you crunch down on the worm when u get near the end? Is the idea to try and keep it whole? I don’t get it. I don’t even mean from a disgusting point of view, because I’m in the ‘animals are animals’ camp. There really is no difference in my mind between eating a cow or eating a ‘cute little rabbit’ if kosher wasn’t a factor for me. I was more shocked by the deceit than the ingredients of Tesco’s horse burgers for example. 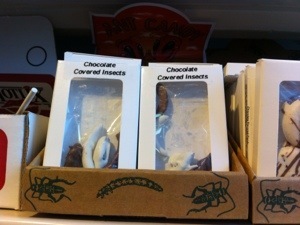 I just don’t understand why anyone would spend a fortune to eat a bug. They can’t be filling, I don’t really believe that you can taste anything under all the chocolate or seasoning they apparently need to be palatable, and they cost about ten times the price of a regular, delicious, non creepy crawling twix bar. So I suppose it must be a status thing. Much in the same way that men swig beer, or teenagers down tequila shots, if you have enough wasps maybe they go from horrible to bearable to quite nice really, with the added benefit that you can pat yourself on the back for being part of an elite few, part of the latest fad, part of the new sensation. Must make you feel bad when you’re watching Pinocchio though. “Always let your conscience be your snack” doesn’t have quite the same ring to it, after all.